Clenching Tongs GE Curved Jaw - $0.00 : Hawkesbury Toolworx - Tools, Farrier Supplies & Outdoors - Specials- For an extensive range of tools for all types of tradesmen and all your farrier, hunting and ammunition or outdoor supplies. 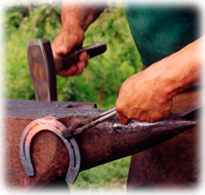 The GE Curved Jaw (or Saddle Horse) is an all-round clincher for everyday use. Made from chrome molybdenum steel, the teeth are heat-treated to hold their bite longer under heavy use.